So the other day I went ahead and decided to create my first Christmas card for the season. I like to wait until after Thanksgiving before I start planning Christmas items, but this year – I need to get on the ball and plan like crazy! PLUS – I am super excited about the beautiful products Close to My Heart has for Christmas. It makes getting into the Christmas card making spirit so much easier!! Coordinating papers and embellishments – makes it all so easy! The pictures for the card turned out horrible; I’m truly sorry but I was so tired that I didn’t want to pull out my light box and lighting set to take beautiful photos. Apologies! This card was super easy to make using Sparkle and Shine Workshop on the Go pack and a few other items. 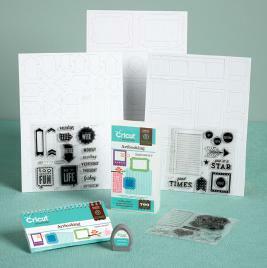 It was originally made for Scrapbooking but now we have some great recipes for cards too! Here are a few more (terrible) photos. All in all, I would say this card took me about 10 minutes to make. That’s how easy it was! I’ll list the specific items I used below but many of them you can get through the Workshop on the Go Kit. And here are some beautiful examples of what you can do with all of the different Close to My Heart products and Christmas Cards. The first 2 photos are from CTMH and the rest of the photos are courtesy of Courtney Lane Designs who allowed me to use her beautiful photos of the wonderful cards she created!! Here are the AWESOME cards that Melanie from Courtney Lane Designs created using Close To My Heart Products. Aren’t they all beautiful? When you join the Close To My Heart family from November 1 to December 15 and submit qualifying personal sales,*you’ll receive a stunning new product, the Picture My Life™ scrapbooking program—FREE! Plus this is a GREAT way to make some extra $$ to pay for the holidays!! Or to get a great discount on all your crafting supplies for the holidays. You can’t beat that – especially since there is no risk! Check out the post here – Holidays from the Heart – to see all of the options you have for free product! This entry was posted in Close To My Heart and tagged Artbooking, Christmas, Christmas card, close to my heart, crafts, Cricut, CTMH, DIY, free, Free product, giveaway, Holiday, Scrapbooking, Shopping by tiannafonz. Bookmark the permalink.